The long geologic history of the Andes has created a diverse and fascinating flora that is completely different from our familiar North American plants. And in spite of 500 years of human history we know relatively little about the biology of these plants. What we do know is just enough to make them exotic and intriguing. In both cases the long histories have left us with some pretty interesting stories. It is these stories, botanical, geological and human, that we will explore in this talk. Ron Long worked as a photographer at SFU for thirty-six years. Much of that time was spent in the Biosciences Department and Ron retains a deep interest in biology and nature. 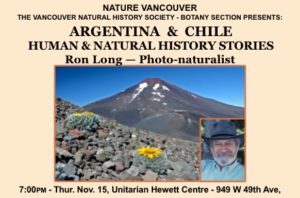 Since retiring Ron travels extensively to out of the way botanical destinations around the world. Ron is a past president of the Native Plant Society of BC, is on the board of the Alpine Garden Club and serves on the Botany Committee of Nature Vancouver.